In this hands-on weekend, you'll not only create your own art pieces, but we will add other sensory experiences like creative visualization, mindfulness practice, and movement. You will have the opportunity to coach and be coached with your creations. No experience necessary! You'll learn techniques to make your own art journal right in the program. In 2015, I began a journey with art after not having touched art materials since elementary school. I was beginning a new business (WomenConnected.net) and was searching for a way to tap into my creativity to imagine a new future and a new company. My jumping off point was with a book by Jennifer Lee called "The Right Brain Business Plan". This book so appealed to me as it went beyond a vision board and used art in lieu of some of the traditional business analysis tools with which I was familiar. From here, the door swung wide open. Using color and creative exercises informed the vision for the WomenConnected.net website and the new journals we were creating. 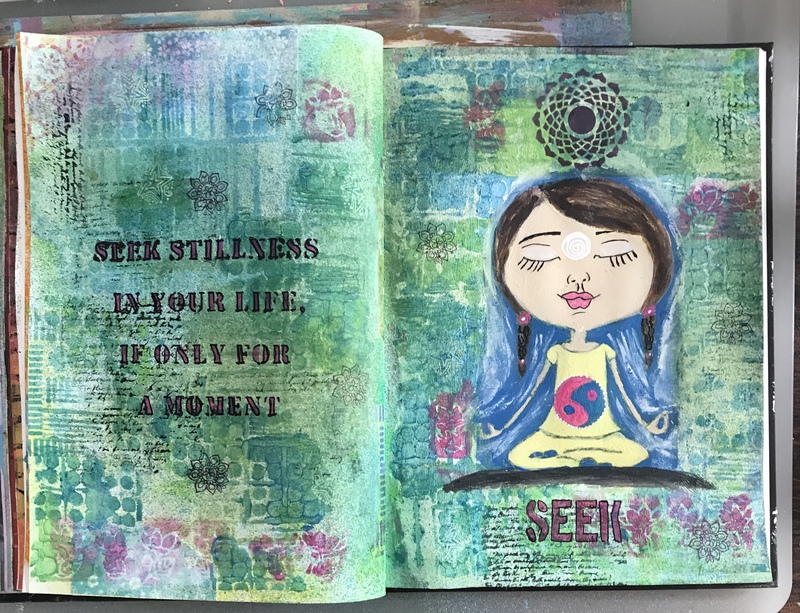 It wasn't long before I discovered the world of Art Journaling and new ways of working with myself and my clients unfolded. The coaching premise of "the answer is within" is often not accessible to the conscious mind. And while we can have wonderful transformations with our clients using language, I became curious as to whether the sensory engagement of art could create the deeper openings for my clients that it was having in my own personal practice. Art, and more importantly the creative process of producing art, supports the creator to experience their inner world, builds self esteem, expands self-awareness, heals emotions, deepens consciousness, integrates new meanings and perspectives, and brings personal satisfaction. I'm finding this is true for all of us, regardless of our age as we are dealing with changes, transitions, stress, and health ups and downs in our lives. During the creative process, deep seated feelings, beliefs, and perspectives begin to emerge in a safe, relaxed atmosphere. The client controls the process, the depth, and the mean-making all of which are fundamental to the coaching relationship. Through art, clients are able to relax the chatter of the monkey mind, and communicate with their subconscious in its own language - that of symbols, color, and metaphor. Timelessness is often described. Here, we learn to express without the need for words. Spontaneity and exploration are encouraged. And meaning making is the final step in the work. Location: The program will be held at Altschul House in Delaware. Here you'll have lots of space to spread out, reflect and meditate during studio time, including working outside, weather permitting. Altschul House is one hour from the Philadelphia airport and with nearby hotels. Specific details will be provided upon registration.